(Editor's Note: Nostrand Park covered this exact same place two days ago, but their post only served to pique my interest further. Credit where credit's due--I just wanted more). 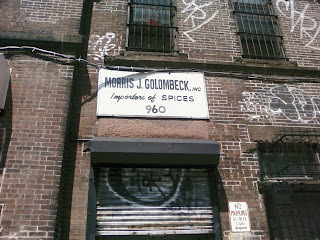 Almost every morning, I run down Franklin to Prospect Park with the lady, which takes us past the enormous old brewery complex at 960 Franklin Avenue, currently the home of Morris J. Golombeck Importers of Spices. We joke that it provides our morning aromatherapy at a far cheaper price than one of those Shaper Image alarm clocks you see in the SkyMall catalog, and make a game out of guessing the various flavors, whose ever-changing odors had been, until now, my only indication that the place remained in operation. 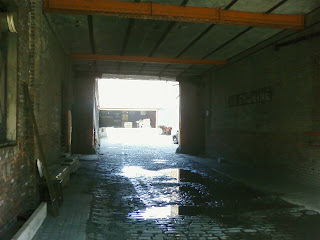 Occasionally we'd see a truck pulling in or out of the lot or even the building entrance, but the building remained mostly a mystery to me. Prompted by Nostrand Park's coverage a few days ago (see above), I began researching the old place, which has quite a story to tell. 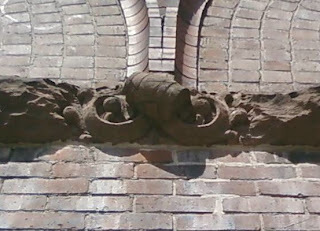 Founded by a cabal of hotel and saloon-keepers in 1897 to stock their shelves and share in the profits, the Consumer's Park Brewery was a precursor to today's microbreweries and brewpubs in that the owners eschewed a pure-production ethos and built a hotel, beer garden, and concert facilities on the site (their loving attention to detail includes kegs that ornament the brick facade). 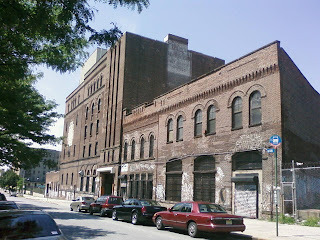 The brewery was also the first all-electric brewery in the United States (which, though I can't document it, may well also mean it was the first in the world), and provided electricity to neighboring homes, leading Crown Heights to sport some of Brooklyn's first electric home lighting. Merging with the New York and Brooklyn Brewing Co. to become the Interboro Brewing Company in 1913 (Frank Jump's Fading Ad blog documents the smokestack that still bears the name), the same year Ebbets Field was built a block away, the company prospered (it even had its own subway stop on the Franklin Avenue Shuttle) until prohibition did it in in the 1920s (the other brewery on Franklin, the Nassau Brewing Company at Franklin and Dean, died around the same time). Armed with this knowledge, I passed the place this morning and dared, for the first time, to ring the bell at the office door. The buzzer rang, and I meekly poked my way in to an office straight out of a Gregory Peck movie: wood paneling, frosted glass on the entrance door, and no cubicles, just broad desks piled high with paper and various measuring devices. Introducing myself, I was greeted with a broad smile by Shelly Golombeck, one of the third generation of Golombecks to run the place (the fourth, his son, sat nearby). "You've caught me on a slow day," he said, shaking my hand warmly, "so I'll show you what we do. We import spices from all over the world, do a little manufacturing, processing, and more recently, blending on site, and we sell in bulk to the food industry, bottling companies, and pharmaceutical companies." Could I buy any? "We sell only in bulk, so the smallest sale I'll do of anything is one bag. For something bulky like oregano, that would be 22 pounds for a bag from Greece or Turkey, 30 for a bag from Mexico. And Chilean oregano is a whole different story. So a local pizza place might come in and ask for a bag of oregano, and we sell it to them. If you want pepper, the smallest is a 110 pound bag of black pepper." "That's a big bag" I remarked. 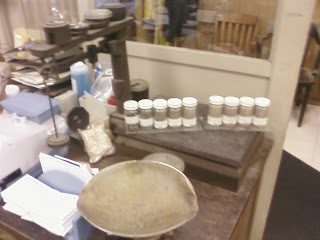 "Not really" said Shelly, leading me over to a table where 12 different bottles of pepper sat next to an antique scale. "We do 12 different grinds, as you can see here. We're very old world: everything is touch, smell, feel, taste with us, because this year's crop is different than last year's crop." Shelly asked me not to photograph the facility (trade secrets are secret, after all), but he did allow office shots, as well as one of the entrance to the main building's cobbelstoned courtyard. Shelly's grandfather, Morris J. Golombeck, founded the company with his son (Shelly's father, who still works there--he was on the phone when I came in) in 1955 and moved into the old brewery, which had done time as the Daisy Mattress Factory in the interim (the fading sign atop the brewery, visible from the north, is their advertisement). The walls of the office document their history--a newspaper photo of Ebbets Field with the buildings in the background, an old bottle from the Interboro Brewing Company that they bought from a collector--and 54 years later, they're still going strong (they've been on Franklin even longer than Jonesy). "We're all trained differently" Shelly says. "My brother is a lawyer, my son is a CPA, my degree is in accounting, so is my father's . . . but this is what we love to do." Nick, despite having never even seen Franklin Avenue, I occasionally check out what you're up to on your blog and this post has even provoked a comment. When I was in Costa Rica last year, I went on a tour of a spice plantation that was pretty cool. They grew vanilla beans (the longest in the world! ), pepper, cinnamon and cocoa (and probably other things I'm forgetting). It was actually very interesting seeing the thought, techniques and traditions that went into it all. Its cool to see where they may have wound up. And for that reason, because spices can be very interesting, I am supporting this post with a comment. i LOVE that when I think about something on the avenue I love, you've done all the leg work for me. Seriously, thank you!! Hi there! Great reporting! A friend and I just came into the posession of two original oak beer barrels from the Interboro Brewery, and were thinking of knocking on the front door ourselves. We're particularly interested to see if there are any remnants of the brewery left there, especially in that funky mansard-roof building around the corner on Montgomery. Do you think they'd be willing to let a couple beer geeks walk around the place? OMG. I always comment that the neighborhood smells of pepper, and I've spent the last year trying to locate the local plant that gives off that spicy smell, concluding it must be something in the botanic gardens. But I've been puzzled, because seasons come and go and yet the spicy pepper smell remains the same. And now I know why!! I live yards away from this place! I love this. When I get a whiff of it I inhale deeply, it smells like home. I didn't write it, I swear!